The 2015 Saudi Super Cup was the third edition of the Saudi Super Cup, an annual football match contested by the winners of the previous season's Saudi Pro League and King's Cup competitions. The match was played between Al-Nassr, the winner of the 2014–15 Saudi Pro League and Al-Hilal, the winner of the 2015 King Cup. It was played on August, 12th 2015. Al-Hilal won 1–0 to win their first Super Cup, with goal by Carlos Eduardo. 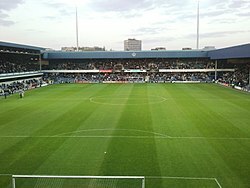 The 2015 Saudi Super Cup was originally scheduled to be played at King Fahd Stadium, in Riyadh on 14 August 2015, however The SAFF decided to change it to be held at Loftus Road Stadium, in London on 12 August 2015. ^ "رئيس لجنة المسابقات: مباراة كأس السوبر في 14 أغسطس" [Math of the super cup on 14 August] (in Arabic). TheSAFF. 10 June 2015. Retrieved 29 June 2015. ^ "أحمد عيد يتوج الهلال بطلاً لكأس السوبر السعودي" (in Arabic). TheSAFF. 12 August 2015. Retrieved 12 August 2015. ^ "After crowning the "Saudi Super Cup", Al-Hilal returns to Riyadh". Alhilal.com. 13 August 2015. Retrieved 13 August 2015. ^ "بيان: نتائج اجتماع مجلس إدارة اتحاد كرة القدم" (in Arabic). TheSAFF. 8 July 2015. Retrieved 8 July 2015. ^ "الموافقة على إقامة مباراة كأس السوبر في لندن" [The super cup will be held in London]. Alriyadh.com (in Arabic). 8 July 2015. Retrieved 8 July 2015.